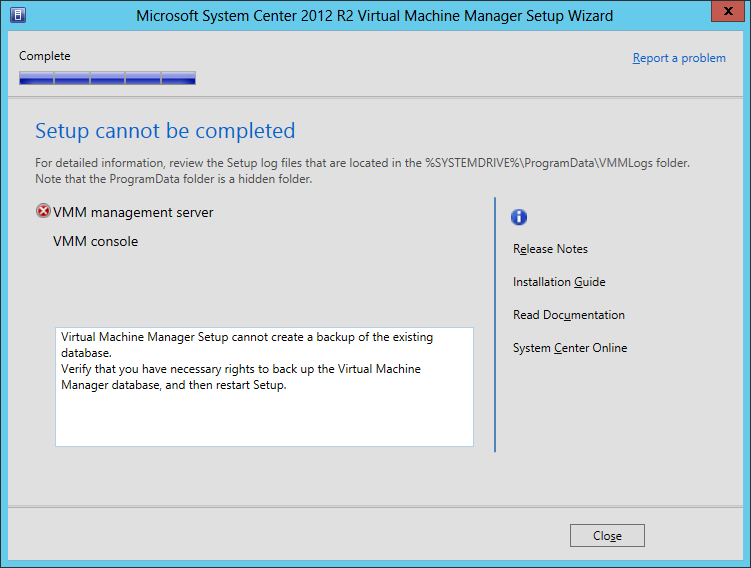 Error Upgrading to VMM 2012 R2. Applies to: SQL Server 2012 Enterprise Edition SP1, System Center Virtual Machine Manager (VMM) 2012 R2. Virtual Machine Manager Setup cannot create a backup of the existing database. Verify that you have the necessary rights to backup the Virtual Machine Manager database, and then restart Setup. Exception : => Either the domain account or the password you entered are not valid. Please enter a valid domain name, user name, and user password and then try the operation again.Microsoft.VirtualManager.Setup.Exceptions.BackEndErrorException: Either the domain account or the password you entered are not valid. Please enter a valid domain name, user name, and user password and then try the operation again. 2014-07-16 08:56:24.54 spid244 Error: 18204, Severity: 16, State: 1. 2014-07-16 08:56:24.54 spid244 BackupDiskFile::CreateMedia: Backup device 'X:\Backups\VirtualManagerDB_m(7)d(16)y(2014)_h(8)m(56).bak' failed to create. Operating system error 3(The system cannot find the path specified.). 2014-07-16 08:56:24.68 Backup Error: 3041, Severity: 16, State: 1. 2014-07-16 08:56:24.68 Backup BACKUP failed to complete the command BACKUP DATABASE VirtualManagerDB. Check the backup application log for detailed messages. 2014-07-16 09:00:36.42 spid232 Error: 18204, Severity: 16, State: 1. 2014-07-16 09:00:36.42 spid232 BackupDiskFile::CreateMedia: Backup device 'X:\Backups\VirtualManagerDB_m(7)d(16)y(2014)_h(9)m(0).bak' failed to create. Operating system error 3(The system cannot find the path specified.). 2014-07-16 09:00:36.42 Backup Error: 3041, Severity: 16, State: 1. 2014-07-16 09:00:36.42 Backup BACKUP failed to complete the command BACKUP DATABASE VirtualManagerDB. Check the backup application log for detailed messages. 2014-07-16 09:05:10.26 spid79 Error: 18204, Severity: 16, State: 1. 2014-07-16 09:05:10.26 spid79 BackupDiskFile::CreateMedia: Backup device 'X:\Backups\VirtualManagerDB_m(7)d(16)y(2014)_h(9)m(5).bak' failed to create. Operating system error 3(The system cannot find the path specified.). 2014-07-16 09:05:10.26 Backup Error: 3041, Severity: 16, State: 1. 2014-07-16 09:05:10.26 Backup BACKUP failed to complete the command BACKUP DATABASE VirtualManagerDB. Check the backup application log for detailed messages. At the beginning we were performing native SQL Server backups on the server, but later we dropped that responsibility on EMC Networker backup program. However, on the Database Setting page of the SQL Server instance properties we found that the default location for backup folders was "X:\Backups" but the folder Backups no longer exists on the X drive. We recreated the folder Backups on the X drive of the computer hosting the SQL Server instance, then restarted the VMM 2012 R2 Setup Wizard and we were able to upgrade successfully this time.